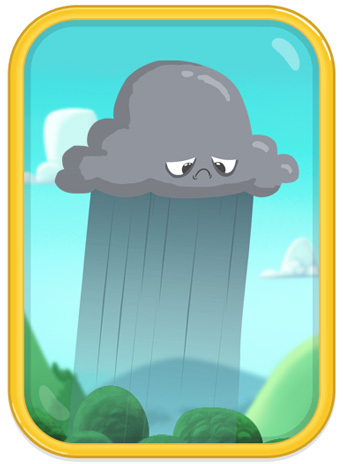 Nimbus is a thoughtful well-meaning cloud who just wants to be a part of all that Sunnyland fun. But Nimbus has one big problem: he can’t hold his RAIN! Yes, every time Nimbus appears, his uncontrollable downpours drench the very folks he wants to befriend. Sometimes Nimbus daydreams of a brighter day (a world where he’s the most popular cloud in the sky and he wins the heart of his secret Flower crush), but then Nimbus comes back to reality and gets glum all over again. We can’t say we blame him. Have you ever made a gumdrop cry? It doesn’t feel good.